During 2009–2011, Colombia experienced extreme hydroclimatic events associated with the extreme phases of El Niño–Southern Oscillation (ENSO). Here, we study the dynamics of diverse land-atmosphere phenomena involved in such anomalous events at continental, regional, and local scales. Standardized anomalies of precipitation, 2-m temperature, total column water (TCW), volumetric soil water (VSW), temperature at 925 hPa, surface sensible heat (SSH), latent heat (SLH), evaporation (EVP), and liquid water equivalent thickness (LWET) are analyzed to assess atmosphere-land controls and relationships over tropical South America (TropSA) during 1986–2013 (long term) and 2009–2011 (ENSO extreme phases). 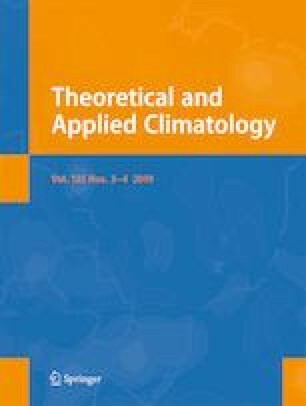 An assessment of the interannual covariability between precipitation and 2-m temperature is performed using singular value decomposition (SVD) to identify the dominant spatiotemporal modes of hydroclimatic variability over the region’s largest river basins (Amazon, Orinoco, Tocantins, Magdalena-Cauca, and Essequibo). ENSO, its evolution in time, and strong and consistent spatial structures emerge as the dominant mode of variability. In situ anomalies during both extreme phases of ENSO 2009–2011 over the Magdalena-Cauca River basins are linked at the continental scale. The ENSO-driven hydroclimatic effects extend from the diurnal cycle to interannual timescales, as reflected in temperature data from tropical glaciers and the rain-snow boundary in the highest peaks of the Central Andes of Colombia to river levels along the Caribbean lowlands of the Magdalena-Cauca River basin. M. Bedoya’s work was supported through “Vulnerability and Adaptation to Climate Extremes in the Americas (VACEA),” part of the International Research Initiative on Adaptation to Climate Change, International Development Research Centre (IDRC) of Canada. The work of G. Poveda and J. J. Vélez made part of the contribution of Universidad Nacional de Colombia to VACEA. We are grateful to IDEAM of Colombia for allowing access to hydrological data. Part of G. Poveda’s work was made possible through a visiting scientist fellowship from the National Center for Atmospheric Research (NCAR), in Boulder, CO, USA. NCAR is sponsored by the National Science Foundation. We are grateful to Yuhan Rao for his comments on the paper. We are also grateful for access to ERA-Interim, GPCC, and GRACE data processed by Sean Swenson with the gravity solutions from the CSR processing center supported by the NASA MEaSUREs Program.